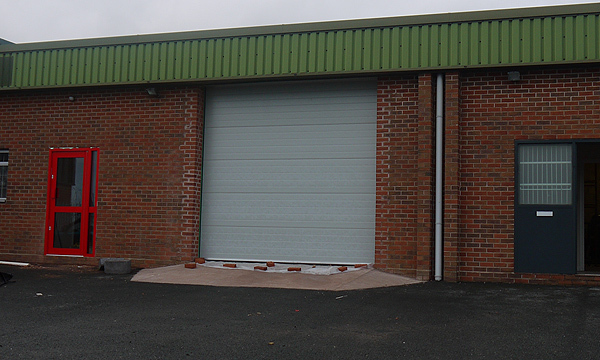 A privately owned car body shop in Birmingham asked us for the best solution to providing a simple manually operated door with high insulation values for the new workshop they had recently started to develop. We supplied them with an externally finished plastisol in grey, handchain operated sectional up and over door. Industrial sectional doors are vertically opening doors constructed using multiple panel sections built to withstand heavy usage using double skinned steel foam filled panels. 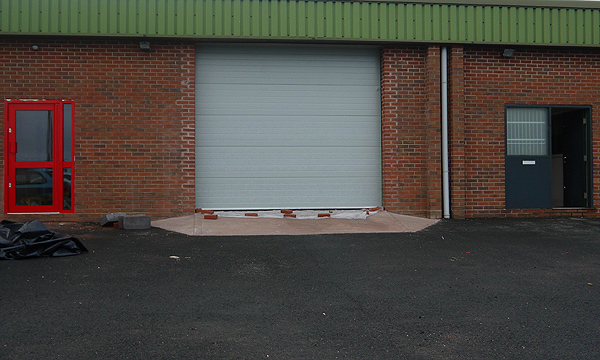 The vertical opening of these doors creates more space in front of and behind the door allowing you to park vehicles closer and utilise more room inside your workshop. When open, the industrial door sections neatly fold up and lay flat beneath the ceiling. For angled roofs, special tracks can be manufactured so that the door panels open in line with your roof. Since the installation, the owner of the business has been very pleased with the ease of door operation, the high quality finish and the great insulation it is providing to his controlled environment workshop. Manufactured to your specific requirements, each of our industrial sectional doors provide reliable service & exceptional ease of use combined with an outstanding level of access control capable of withstanding high usage volumes to cope with all levels of industrial workloads. external colour finishes are available in many different colours and availability should be checked before ordering your insulated sectional overhead door.